In less than a week’s time Google will be holding court in New York to reveal some less-than-mysterious new hardware offerings. Those Pixel 3 and Pixel 3 XL smartphones might have been thoroughly leaked ahead of next week’s gathering, but what other surprises has Google managed to keep under wraps? The event officially gets under way at 11am ET on Tuesday, October 9, and as in past years you should be able to watch it live on YouTube. Gizmodo will be there reporting on all the new hardware to find out what’s neat, what’s noteworthy, and what’s not worth your time. Until then, here’s a crash course on everything we expect to see. This one’s basically a foregone conclusion, and that’s not only because Google typically reveals its smartphones in October and the company tagged the official invite with the #madebygoogle hashtag it reserves for hardware. For months we’ve been inundated with leak after leak after leak of the devices leading up to this event. The first and most thorough reveal came from Russian blog Rozetked, which seemingly got its hands on a Pixel 3 XL almost two months ago. The leak appears to reveal that, at least for its larger handset, Google will also be embracing the notorious smartphone notch, while maintaining a larger bottom bezel to accommodate the Pixel’s forward-facing stereo speakers. The size of the Pixel 3 XL’s 2960 x 1440-pixel display hasn’t been confirmed yet, but the device apparently runs on a Snapdragon 845 processor and will come installed with Android 9 Pie—no surprises there. Rozetked also took the opportunity to try out the suspected Pixel 3 XL’s camera, and the results suggest that the smartphone might once again out-perform other smartphone cameras on the market, which has been a hallmark selling point of the Pixel line in recent years. The leaked photos also revealed the smartphone’s packaging, which included what looked like a fully wired version of Google’s Pixel Buds, but they weren’t tested to see if they worked with the company’s Google Assistant or instant translation features like the wireless versions do. Those of you with smaller hands and pockets weren’t left out of the leak fun, however. 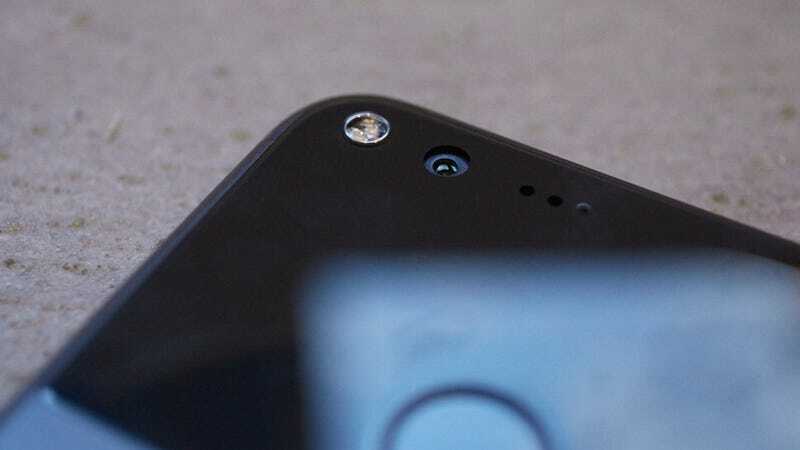 About a month ago a bunch of photos of the purported Pixel 3 appeared in an Imgur gallery, revealing a generous but reasonably-sized 5.5-inch screen (a half-inch larger than the Pixel 2), a two-tone back panel, a pair of eight-megapixel front-facing cameras that could facilitate wide-angle selfie shots, but no screen notch up top. Instead, the Pixel 3 will have aesthetically-pleasing matching bezels on the top and bottom. One other feature gleaned from the Pixel 3 photos is a battery with a potential capacity of around 3,000 mAh, which is not only larger than the Pixel 2's, but also larger than the 2,658 mAh battery Apple is including with the iPhone Xs. We’ll have a lot more to talk about on October 9. To get the full scoop, catch the big reveal via livestream. Preorders start immediately after the event. It seems vague, but the email also included an animated GIF of the number “3" which could easily be interpreted to mean the new Pixel smartphones. Update 10/4/18 12:51pm EST — AndroidHeadlines claims a reliable source has provided them with renders of not only the XL and regular versions of the Pixel 3, but also the color options that will be available. In addition to black and white, the Pixel 3s will possibly come in a light pink tint as well. Smart speakers became more than just talking heads when Amazon upgraded Alexa and the Echo Show with a touchscreen display back in 2017. Screens are now en vogue, and a smart addition as the Lenovo Smart Display for Google Assistant proved. So it comes as no surprise that back in August a report from Nikkei claimed Google was planning to release a smart display of its own ahead of the holiday season. A website called MySmartPrice also shared what appears to be leaked renders of the device, revealing a seven-inch touchscreen. What remains to be seen is how Google could potentially differentiate its smart display from Lenovo’s, which runs stock Android and has enjoyed a few months head start. Compatibility with smart home thermostats? Extra functionality as a smart security camera for your home? Or will cute pastel colors be enough for these to outsell the competition? Yesterday Google revealed a new Aqua-colored version of the Google Home Mini, which seems to indicate the product isn’t going to see a refresh next week. And if the pretty affordable Home Mini isn’t getting an update this year, which is the most popular smart speaker Google sells, would the pricier Google Home be getting one? So far there’s no evidence that’s happening. Potentially first leaked by FCC documentation back in April, there’s now no doubt that a new version of Google’s streaming stick is en route after Best Buy sold a Chromecast 3 to a customer before the device was officially listed in the store’s system. Reddit user GroveStreetHomie shared a photo of the third-generation Chromecast they managed to buy, which, according to previous leaks, will run on a quad-core Amlogic S905X processor powered by 2GB of RAM and 8GB of storage enabling 4K content to be streamed at up to 60 frames per second. When Apple killed the headphone jack, it tried to make up for it with a great pair of wireless earbuds that helped fill the hole. Google followed suit with its own wireless earbuds called the Pixel Buds that were, by comparison, definitely not as great. There’s a lot of room for improvement here, and a lot of catch up needed given how many excellent wireless earbud options are now on the market. Google could start by removing the cord that tethers the Pixel Buds together, improving the functionality of the charging case, and maybe even making that fancy real-time translation functionality available on more Android phones. The $1,000, transforming, Chrome OS-running Pixelbook is coming up on its one-year anniversary, which means it’s almost an antique at this point. Does Google plan to release an updated version with improved specs? There have been rumors about two successors in development code-named “Nocturne” and “Meowth” which were both apparently referenced in the Chromium source code (Google’s open-source web browser) earlier this year. According to 9to5Google, the new Pixelbook might actually be named the Pixel Slate and will come in the form of a Chrome OS-powered detachable tablet that can separate from a backlit keyboard accessory, instead of having it just flip out of the way beneath the screen. The Pixel Slate would potentially come in a version powered by Intel’s Kaby Lake processor for better performance, or the low-power Amber Lake variant for maximizing the device’s battery life and improving its price point. Other rumored features include a 3:2-ratio, 3,000 x 2,000-pixel display, two USB-C ports but no SD card slot, and a fingerprint sensor located on the tablet’s bezel. It would certainly be nice to see the developer of Wear OS release a smartwatch optimized for all the ins and outs of the wrist-worn operating system. But 2018 won’t be the year Google jumps on the wearable bandwagon. During a recent phone call with Tom’s Guide, Miles Barr, Google’s director of engineering for Wear OS, confirmed the company had no plans to release a smartwatch this year, and would instead focus on improving Wear OS itself. Did the FCC Just Reveal Google’s Next Streaming Dongle? Is This Really What the Google Pixel 3 Will Look Like?